Drax the Destroyer seems like a highly impatient and ruthless warrior. He definitely has the killer moves to prove it. However, that’s not everything about him. Drax’s thirst for vengeance is merited since he lost his entire family to a murderer. But he’s also very innocent and excitable. This child-like demeanor is highly amusing when it surfaces as it’s quite the opposite of his usual calm and stoic persona. Drax doesn’t wear much. He only has on a pair of black pants and black boots. His bluish blue skin tinged with red details is out for all to see. Here’s everything you need to look like Drax. 1 Black Cargo Pants Since this is Drax’s only piece of clothing, having pockets is essential to help him bring everything he needs. 2 Black Tactical Boots A sturdy pair of black tactical boots is required if you’re going to go adventuring across the universe. 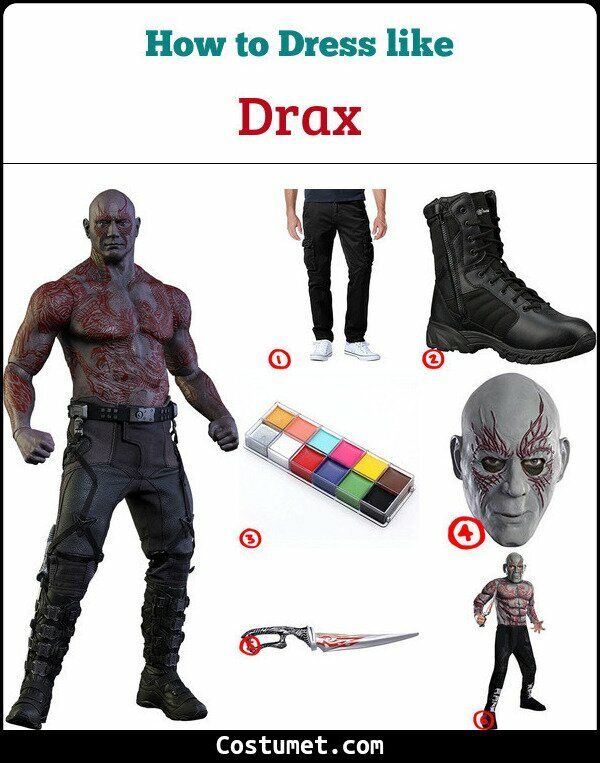 3 Body Paint Use this body paint to get Drax’s skin color and skin details. 4 Mask If you don’t want to paint your face, you can always choose this Drax mask. 5 Knife Bring along the knife Drax prefers to use. 6 Kids Costume Set Transform your kid into Drax with this costume set. 7 Full Costume Set DIY-ing is no longer needed if you buy this costume set. Drax is portrayed by Dave Bautista. Bautista was also known as the wrestler Batista from the WWE before he did film acting full-time. Yondu likes to wear one dark cargo pants, dark boots, dark leather vest, and an awesome-looking brown trench coat. Red Skull costume is a black leather trench coat with the Hydra sign on it, a belt with the Hydra buckle, black pants, black gloves, black leather boot. Rocket Raccoon is also dressed up in light protective gear and can mostly be seen with a weapon in his hand.